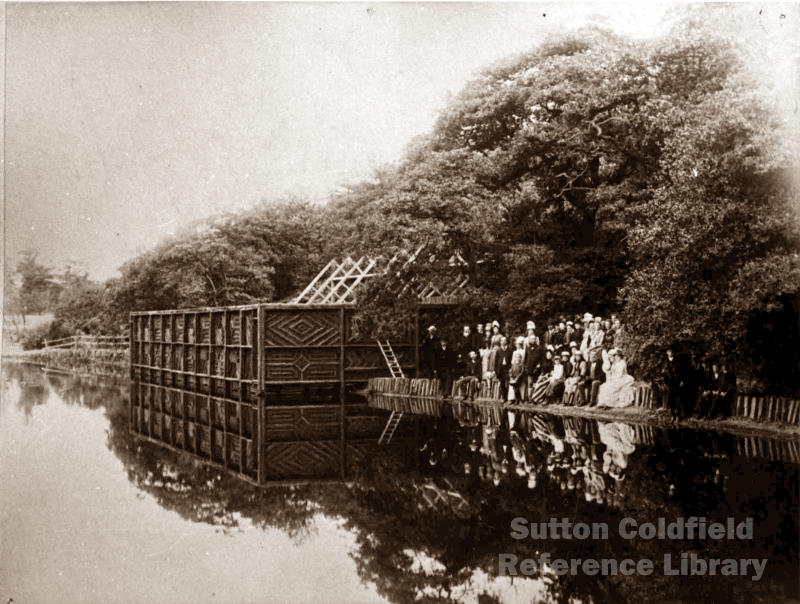 The official opening of Keepers Baths, July 30th 1887 (photo courtesy of Sutton Reference Library). “The dam at Keepers Pool broke one day” wrote Richard Holbeche in his Diary, “carrying off all the water, which much surprised the Wiggans.” In 1850 the blade mill powered by the stream issuing out of Keepers Pool closed down, and the property had a new owner, Mr. John Wiggan, who set about turning it into a gentleman’s residence, renamed Park House, with ornamental walks along the stream - in 1859, when Keepers dam broke, Park House was the only building affected by the flood. Lord Somerville was the owner of Keepers Pool, and in 1859 he was given permission by the Warden and Society (that is, Sutton Town Council) to take material from the adjacent gravel pit to repair the dam. John Buggins of Booths Farm (which stood at the junction of Halton Road and Darnick Road) was leasing Keepers Pool from Lord Somerville at the time, and it was he who undertook the repair work. The Warden and Society was being asked to make proper provision for the healthy exercise of swimming in the 1850s. A subcommittee was appointed, and reported in 1859 that a site adjacent to Keepers Pool could be made into public swimming baths for £200, but the proposal was voted down as too expensive. £3,500 was paid out twenty years later, however, when the Warden and Society purchased Keepers Pool and some land in Boldmere from the Somerville Estate. In 1886 a new Borough Charter gave Sutton Coldfield a democratically elected council in place of the old self-appointed Warden and Society, and the question of public swimming baths was revived. The old plan of open-air baths at Keepers Pool was dusted down and presented in the report of the Park, Estates and Buildings Committee of the new corporation to the Council meeting of March 2nd 1887. The report was approved, and the baths were officially opened on July 30th 1887. The baths were open in the summer months only, and in most years were a modest success; in 1898, when 4470 bathers paid the entrance fee (which included hire of towels and costumes), and 772 children in elementary school classes were admitted free, the takings of £43 just covered the costs. This pattern of use continued, but even in bumper years when the sun shone every day, like 1911 when there were over twelve thousand bathers, or 1939 with 21,487, the baths were run at a loss. In 2003 the baths were demolished and the site grassed over.